The Antikythera mechanism (/ˌæntɪkɪˈθɪərə/, /ˌæntɪˈkɪθərə/) is an ancient Greek analogue computer used to predict astronomical positions and eclipses for calendar and astrological purposes decades in advance. It could also be used to track the four-year cycle of athletic games which was similar to an Olympiad, the cycle of the ancient Olympic Games. The artefact was retrieved from the sea in 1901, and identified on 17 May 1902 as containing a gear wheel by archaeologist Valerios Stais, among wreckage retrieved from a wreck off the coast of the Greek island Antikythera. The instrument is believed to have been designed and constructed by Greek scientists and has been variously dated to about 87 BC, or between 150 and 100 BC, or to 205 BC, or to within a generation before the shipwreck, which has been dated to approximately 70–60 BC. The Antikythera mechanism was retrieved from 45 metres (148 ft) of water in the Antikythera shipwreck off Point Glyphadia on the Greek island of Antikythera in 1901, most probably in July of that year. The wreck had been found in April 1900 by a group of Greek sponge divers who retrieved numerous large artefacts, including bronze and marble statues, pottery, unique glassware, jewellery, coins, and the mechanism. All were transferred to the National Museum of Archaeology in Athens for storage and analysis. The mechanism was merely a lump of corroded bronze and wood at the time and went unnoticed for two years, while museum staff worked on piecing together more obvious statues. Two other searches for items at the Antikythera wreck site in 2012 and 2015 have yielded a number of fascinating art objects and a second ship which may or may not be connected with the treasure ship on which the Mechanism was found. Also found was a bronze disk, with the image of a bull embellished on it. The disk has four "ears" which have holes in them, and it was thought by some that it may have been part of the Antikythera Mechanism itself, as a "cog wheel". However, there appears to be little evidence that it was part of the Mechanism; it is more likely that the disk was a bronze decoration on a piece of furniture. 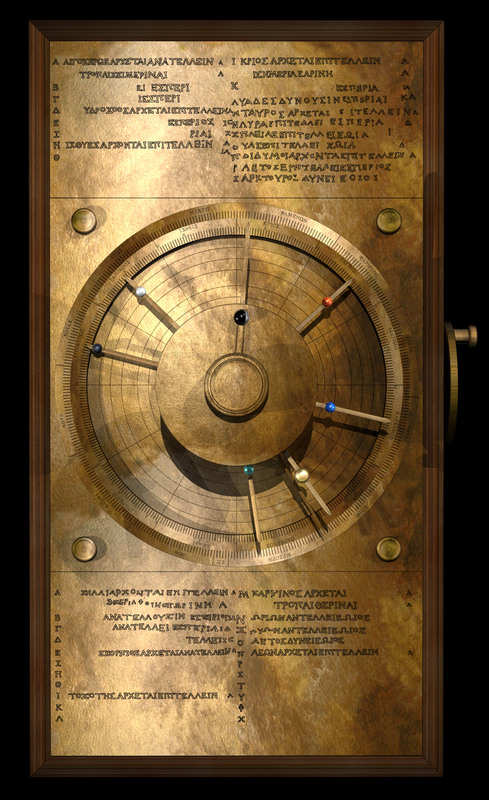 The Antikythera mechanism is generally referred to as the first known analogue computer. The quality and complexity of the mechanism's manufacture suggests that it has undiscovered predecessors made during the Hellenistic period. Its construction relied on theories of astronomy and mathematics developed by Greek astronomers during the second century BC, and it is estimated to have been built in the late second century BC or the early first century BC. In 2014, a study by Carman and Evans argued for a new dating of approximately 200 BC based on identifying the start-up date on the Saros Dial as the astronomical lunar month that began shortly after the new moon of 28 April 205 BC. Moreover, according to Carman and Evans, the Babylonian arithmetic style of prediction fits much better with the device's predictive models than the traditional Greek trigonometric style. A study by Paul Iversen published in 2017 reasons that the prototype for the device was indeed from Rhodes, but that this particular model was modified for a client from Epirus in northwestern Greece, and that it was probably constructed no earlier than a generation before the shipwreck. Further dives were undertaken in 2014, with plans to continue in 2015, in the hope of discovering more of the mechanism. E 60 × 35 22.1 Yes Found in 1976 and contains six inscriptions from the upper right of the Saros spiral. The Metonic Dial is the main upper dial on the rear of the mechanism. The Metonic cycle, defined in several physical units, is 235 synodic months, which is very close (to within less than 13 one-millionths) to 19 tropical years. It is therefore a convenient interval over which to convert between lunar and solar calendars. The Metonic dial covers 235 months in five rotations of the dial, following a spiral track with a follower on the pointer that keeps track of the layer of the spiral. The pointer points to the synodic month, counted from new moon to new moon, and the cell contains the Corinthian month names. The epicyclic Solar System of Ptolemy (c. CE 100 – c. 170) – still 300 years in the future from the apparent date of the mechanism – carried forward with more epicycles, and was more accurate predicting the positions of planets than the view of Copernicus (CE 1473 – 1543 CE), until Kepler (CE 1571 – 1630) introduced the possibility that orbits are ellipses. ^ Change from traditional naming: X is the main year axis, turns once per year with gear B1. The B axis is the axis with gears B3 and B6, while the E axis is the axis with gears E3 and E4. Other axes on E (E1/E6 and E2/E5) are irrelevant to this table. ^ "Time" is the interval represented by one complete revolution of the gear. ^ As viewed from the front of the Mechanism. The "natural" view is viewing the side of the Mechanism the dial/pointer in question is actually displayed on. ^ The Greeks, being in the northern hemisphere, assumed proper daily motion of the stars was from east to west, ccw when the ecliptic and zodiac is viewed to the south. As viewed on the front of the Mechanism. 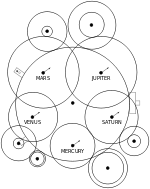 ^ a b c d e f g h On average, due to epicyclic gearing causing accelerations and decelerations. ^ This was the only visual pointer naturally travelling in the counter-clockwise direction. ^ Internal and not visible. ^ a b c d e f Prograde motion; retrograde is obviously the opposite direction. The Olympiad train is driven by b1, b2, l1, l2, m1, m2, n1, n2, and o1, which mounts the pointer. It has a computed modelled rotational period of exactly four years, as expected. Incidentally, it is the only pointer on the mechanism that rotates counter-clockwise; all of the others rotate clockwise. In total, there are eight coaxial spindles of various nested sizes to transfer the rotations in the mechanism to the eight pointers. 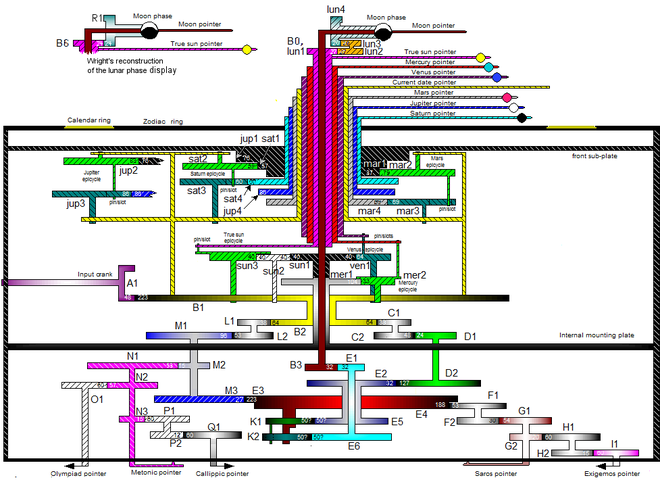 So in all, there are 30 original gears, seven gears added to complete calendar functionality, 17 gears and three slotted bars to support the six new pointers, for a grand total of 54 gears, three bars, and eight pointers in Freeth and Jones' design. In short, the Antikythera Mechanism was a machine designed to predict celestial phenomena according to the sophisticated astronomical theories current in its day, the sole witness to a lost history of brilliant engineering, a conception of pure genius, one of the great wonders of the ancient world—but it didn't really work very well! Cicero's De re publica, a 1st-century BC philosophical dialogue, mentions two machines that some modern authors consider as some kind of planetarium or orrery, predicting the movements of the Sun, the Moon, and the five planets known at that time. They were both built by Archimedes and brought to Rome by the Roman general Marcus Claudius Marcellus after the death of Archimedes at the siege of Syracuse in 212 BC. Marcellus had great respect for Archimedes and one of these machines was the only item he kept from the siege (the second was placed in the Temple of Virtue). The device was kept as a family heirloom, and Cicero has Philus (one of the participants in a conversation that Cicero imagined had taken place in a villa belonging to Scipio Aemilianus in the year 129 BC) saying that Gaius Sulpicius Gallus (consul with Marcellus's nephew in 166 BC, and credited by Pliny the Elder as the first Roman to have written a book explaining solar and lunar eclipses) gave both a "learned explanation" and a working demonstration of the device. In 2018, the owner of the site Clickspring Projects began video documenting a reconstruction of the Antikythera mechanism aiming to use methods and materials as closely representative to those employed by ancient astronomical instrument makers. As of 2012[update], the Antikythera mechanism was displayed as part of a temporary exhibition about the Antikythera Shipwreck, accompanied by reconstructions made by Ioannis Theofanidis, Derek de Solla Price, Michael Wright, the Thessaloniki University and Dionysios Kriaris. Other reconstructions are on display at the American Computer Museum in Bozeman, Montana, at the Children's Museum of Manhattan in New York, at Astronomisch-Physikalisches Kabinett in Kassel, Germany, and at the Musée des Arts et Métiers in Paris. A fully functioning Lego reconstruction of the Antikythera mechanism was built in 2010 by hobbyist Andy Carrol, and featured in a short film produced by Small Mammal in 2011. Several exhibitions have been staged worldwide, leading to the main "Antikythera shipwreck" exhibition at the National Archaeological Museum in Athens, Greece. A fictionalised version of the device was a central plot point in the film Stonehenge Apocalypse (2010), where it was used as the artefact that saved the world from impending doom. Erich von Däniken, in his 1968 book Chariots of the Gods?, presented it as one of the many "evidences" of ancient aliens visiting earth and leaving behind technology. ^ "Project overview". The Antikythera Mechanism Research Project. Retrieved 1 July 2007. The Antikythera Mechanism is now understood to be dedicated to astronomical phenomena and operates as a complex mechanical 'computer' which tracks the cycles of the Solar System. ^ Swedin, Eric G.; Ferro, David L. (24 October 2007). Computers: The Life Story of a Technology. JHU Press. p. 1. ISBN 978-0-8018-8774-1. Retrieved 28 May 2013. It was a mechanical computer for calculating lunar, solar, and stellar calendars. ^ Paphitis, Nicholas (30 November 2006). "Experts: Fragments an Ancient Computer". Washington Post. Imagine tossing a top-notch laptop into the sea, leaving scientists from a foreign culture to scratch their heads over its corroded remains centuries later. A Roman shipmaster inadvertently did something just like it 2,000 years ago off southern Greece, experts said late Thursday. ^ a b c d e f g h i j k l m n o p q r s Freeth, Tony; Bitsakis, Yanis; Moussas, Xenophon; Seiradakis, John. H.; Tselikas, A.; Mangou, H.; Zafeiropoulou, M.; Hadland, R.; et al. (30 November 2006). "Decoding the ancient Greek astronomical calculator known as the Antikythera Mechanism" (PDF). Nature. 444 (7119): 587–91. Bibcode:2006Natur.444..587F. doi:10.1038/nature05357. PMID 17136087. Retrieved 20 May 2014. ^ a b c d e f g h i j k l m n o p q r s t u Freeth, Tony; Jones, Alexander (2012). "The Cosmos in the Antikythera Mechanism". Institute for the Study of the Ancient World. Retrieved 19 May 2014. ^ Pinotsis, A. D. (30 August 2007). "The Antikythera mechanism: who was its creator and what was its use and purpose?". Astronomical and Astrophysical Transactions. 26 (4–5): 211–226. Bibcode:2007A&AT...26..211P. doi:10.1080/10556790601136925. ^ a b c d e f g h i j k l m n o p q r s Freeth, Tony; Jones, Alexander; Steele, John M.; Bitsakis, Yanis (31 July 2008). "Calendars with Olympiad display and eclipse prediction on the Antikythera Mechanism" (PDF). Nature. 454 (7204): 614–7. Bibcode:2008Natur.454..614F. doi:10.1038/nature07130. PMID 18668103. Retrieved 20 May 2014. ^ a b Paul Iversen, "The Calendar on the Antikythera Mechanism and the Corinthian Family of Calendars, Hesperia 86 (2017): 130 and note 4. ^ Palazzo, Chiara (17 May 2017). "What is the Antikythera Mechanism? How was this ancient 'computer' discovered?". The Telegraph. Retrieved 10 June 2017. ^ Alexander Jones, A Portable Cosmos, Oxford: Oxford University Press, pp. 10–11. ^ a b Price, Derek de Solla (1974). "Gears from the Greeks. 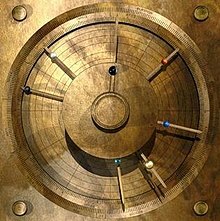 The Antikythera Mechanism: A Calendar Computer from ca. 80 B. C.". Transactions of the American Philosophical Society. New Series. 64 (7): 1–70. doi:10.2307/1006146. JSTOR 1006146. ^ a b c Carman, Christián C.; Evans, James (15 November 2014). "On the epoch of the Antikythera mechanism and its eclipse predictor". Archive for History of Exact Sciences. 68 (6): 693–774. doi:10.1007/s00407-014-0145-5. ^ a b c Markoff, John (24 November 2014). "On the Trail of an Ancient Mystery - Solving the Riddles of an Early Astronomical Calculator". The New York Times. Retrieved 25 November 2014. ^ Paul Iversen, "The Calendar on the Antikythera Mechanism and the Corinthian Family of Calendars," Hesperia 86 (2017): 182–183. ^ "Decoding The Antikythera Mechanism - Investigation of An Ancient Astronomical Calculator". Bibliotecapleyades.net. Retrieved 13 November 2012. ^ a b c d e f g h i Freeth, Tony (2006). "Decoding the Antikythera Mechanism: Supplementary Notes 2" (PDF). Nature. 444 (7119): 587–91. Bibcode:2006Natur.444..587F. doi:10.1038/nature05357. PMID 17136087. Retrieved 20 May 2014. ^ Sample, Ian. "Mysteries of computer from 65 BC are solved". The Guardian. "This device is extraordinary, the only thing of its kind," said Professor Edmunds. "The astronomy is exactly right ... in terms of historic and scarcity value, I have to regard this mechanism as being more valuable than the Mona Lisa." and "One of the remaining mysteries is why the Greek technology invented for the machine seemed to disappear." ^ a b c d e Marchant, Jo (30 November 2006). "In search of lost time". Nature. 444 (7119): 534–538. Bibcode:2006Natur.444..534M. doi:10.1038/444534a. PMID 17136067. ^ "History - Antikythera Mechanism Research Project". www.antikythera-mechanism.gr. ^ Haughton, Brian (26 December 2006). Hidden History: Lost Civilizations, Secret Knowledge, and Ancient Mysteries. Career Press. pp. 43–44. ISBN 978-1-56414-897-1. Retrieved 16 May 2011. ^ "Ancient 'computer' starts to yield secrets". IOL: Technology. Independent Media. 7 June 2006. Archived from the original on 13 March 2007. Retrieved 16 July 2017. ^ Allen, Martin (27 May 2007). "Were there others? The Antikythera Mechanism Research Project". Antikythera-mechanism.gr. Archived from the original on 21 July 2011. Retrieved 24 August 2011. ^ a b Paul Iversen, "The Calendar on the Antikythera Mechanism and the Corinthian Family of Calendars", Hesperia 86 (2017) 129–203. 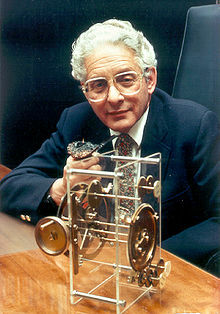 ^ "Jacques-Yves Cousteau – Antikythera Mechanism Research Project". www.antikythera-mechanism.gr. ^ "What was it made of?". Antikythera Mechanism Research Project. 4 July 2007. Retrieved 16 May 2012. ^ Paul Iversen, "The Calendar on the Antikythera Mechanism and the Corinthian Family of Calendars", Hesperia 86 (2017): 134–141. ^ Marchant, Jo (2006). Decoding the Heavens. Da Capo Press. p. 180. mechanical engineer and former curator of London's Science Museum Michael Wright tells of a piece breaking off in his inspection, which was glued back into place by the museum staff. ^ Wright, Michael T. (2007). "The Antikythera Mechanism reconsidered". Interdisciplinary Science Reviews. 32 (1): 21–43. doi:10.1179/030801807X163670. ^ a b Freeth, T. (2009). "Decoding an Ancient Computer". Scientific American. 301 (6): 76–83. Bibcode:2009SciAm.301f..76F. doi:10.1038/scientificamerican1209-76. PMID 20058643. ^ Jones, Alexander (2017), A Portable Cosmos, Oxford: Oxford University Press, p. 97, ISBN 9780190618599 . ^ Wright, Michael T. (March 2006). "The Antikythera Mechanism and the early history of the moon phase display" (PDF). Antiquarian Horology. 29 (3): 319–329. Retrieved 16 June 2014. ^ Wilford, J. N. (31 July 2008). "Discovering how greeks computed in 100 B.C." The New York Times. ^ Connor, S. (31 July 2008). "Ancient Device Was Used To Predict Olympic Games". The Independent. London. Retrieved 27 March 2010. ^ Paul Iversen, "The Calendar on the Antikythera Mechanism and the Corinthian Family of Calendars, Hesperia 86 (2017): 148–168. ^ Freeth, T (2009). "Decoding an Ancient Computer". Scientific American. 301 (6): 76–83. Bibcode:2009SciAm.301f..76F. doi:10.1038/scientificamerican1209-76. PMID 20058643. 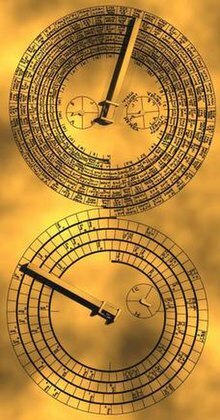 ^ a b Paul Iversen, "The Calendar on the Antikythera Mechanism and the Corinthian Family of Calendars, Hesperia 86 (2017): 148-164. ^ Paul Iversen, "The Calendar on the Antikythera Mechanism and the Corinthian Family of Calendars, Hesperia 86 (2017): 165–185. ^ "Olympic link to early 'computer'". BBC News. Retrieved 15 December 2008. ^ Paul Iversen, "The Calendar on the Antikythera Mechanism and the Corinthian Family of Calendars, Hesperia 86 (2017): 141–147. ^ Carman, Christián C.; Evans, James (15 November 2014). "On the epoch of the Antikythera mechanism and its eclipse predictor". Archive for History of Exact Sciences. 68 (6): 693–774. ^ "Does it favour a Heliocentric, or Geocentric Universe?". Antikythera Mechanism Research Project. 27 July 2007. Archived from the original on 21 July 2011. Retrieved 24 August 2011. ^ a b c d Evans, James; Carman, Christián C.; Thorndyke, Alan (February 2010). "Solar anomaly and planetary displays in the Antikythera Mechanism" (PDF). Journal for the History of Astronomy. xli: 1–39. Retrieved 20 May 2014. ^ Wright, Michael T. (June 2005). "The Antikythera Mechanism: a new gearing scheme" (PDF). Bulletin of the Scientific Instrument Society. 85: 2–7. Retrieved 12 March 2017. ^ a b c d e f g h i Edmunds, Mike G.; Freeth, Tony (July 2011). "Using Computation to Decode the First Known Computer". IEEE Computer Magazine. 2011-7 (7): 32–39. doi:10.1109/MC.2011.134. ^ Carman, Christián C.; Thorndyke, Alan; Evans, James (2012). "On the Pin-and-Slot Device of the Antikythera Mechanism, with a New Application to the Superior Planets" (PDF). Journal for the History of Astronomy. 43 (1): 93–116. Bibcode:2012JHA....43...93C. doi:10.1177/002182861204300106. Retrieved 21 May 2014. ^ Geoffrey, Edmunds, Michael (1 August 2011). 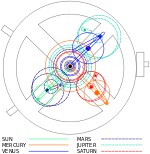 "An Initial Assessment of the Accuracy of the Gear Trains in the Antikythera Mechanism". Journal for the History of Astronomy. 42 (3): 307–320. doi:10.1177/002182861104200302. Retrieved 10 May 2016. ^ Marchant, Jo (2009). Decoding the Heavens. First Da Capo Press. p. 40. ISBN 978-0-306-81742-7. ^ Netz & Noel, Reviel & William (2007). The Archimedes Codex. Da Capo Press. p. 1. ISBN 978-0-306-81580-5. ^ Pickover, Clifford (2011). The Physics Book. Sterling. p. 52. ISBN 978-1-4027-7861-2. ^ "M. TVLLI CICERONIS DE RE PVBLICA LIBER PRIMVS". Archived from the original on 22 March 2007. Retrieved 23 March 2007. ^ Rorres, Chris. "Archimedes: Spheres and Planetaria (Introduction)". New York University. Archived from the original on 10 May 2011. Retrieved 27 March 2011. ^ Fildes, Jonathan (29 November 2006). "Ancient Moon 'computer' revisited". BBC News. Retrieved 25 April 2010. ^ Needham. Needham. 4, Part. p. 285. ^ Sleeswyk, Andre (October 1981). "Vitruvius' odometer". Scientific American. 252 (4). pp. 188–200. See also: Andre Wegener Sleeswyk, "Vitruvius' waywiser", Archives internationales d'histoire des sciences, vol. 29, pages 11–22 (1979). ^ "Cicero, De Natura Deorum II.88 (or 33–34)". Archived from the original on 16 March 2007. Retrieved 23 March 2007. ^ Archaeology: High tech from Ancient Greece, François Charette, Nature 444, #7119 (30 November 2006), pp. 551–552, doi: 10.1038/444551a. ^ a b Maddison, Francis (28 March 1985). "Early mathematical wheelwork: Byzantine calendrical gearing". Nature. 314 (6009): 316–317. Bibcode:1985Natur.314..316M. doi:10.1038/314316b0. .
^ Staff (17 May 2017). "115 Anniversary of the Antikythera Mechanism Discovery". Google. Retrieved 17 May 2017. ^ Smith, Reiss (17 May 2017). "What is the Antikythera mechanism? Google Doodle marks discovery of ancient Greek computer". BBC. Retrieved 17 May 2017. ^ "The Antikythera Shipwreck: the Ship, the Treasures, the Mechanism". Antikythera Mechanism Research Project. 6 June 2012. Retrieved 16 April 2013. ^ "The World's First Computer". Antikythera Mechanism Research Project. Retrieved 21 January 2013. ^ "BBC Four - The Two-Thousand-Year-Old Computer". ^ "Ancient Computer". NOVA. PBS. Retrieved 13 May 2014. ^ Pavlus, John. "Small Mammal, Behind the Scenes: Lego Antikythera Mechanism". Small Mammal. Retrieved 19 July 2018. ^ "Exhibitions". The Antikythera Mechanism Research Project. ^ Gracey, James (23 May 2011). "Behind The Couch: 'Stonehenge Apocalypse'". BehindTheCouch web site. Retrieved 23 May 2011. Marchant, Jo (6 November 2008). Decoding the Heavens: Solving the Mystery of the World's First Computer. William Heinemann Ltd. ISBN 978-0-434-01835-2. Russo, Lucio (2004). The Forgotten Revolution: How Science Was Born in 300 BC and Why It Had To Be Reborn. Berlin: Springer. ISBN 978-3-540-20396-4. Steele, J. M. (2000). Observations and Predictions of Eclipse Times by Early Astronomers. Dordrecht: Kluwer Academic. ISBN 978-0-7923-6298-2. Stephenson, F. R. (1997). Historical Eclipses and the Earth's Rotation. Cambridge, UK: Cambridge Univ. Press. ISBN 978-0-521-46194-8. Rosheim, Mark E. (1994). Robot Evolution: The Development of Anthrobotics. John Wiley & Sons. ISBN 978-0-471-02622-8. Steele, J. M. (2000). "Eclipse prediction in Mesopotamia". Arch. Hist. Exact Sci. 54 (5): 421–454. Bibcode:2000AHES...54..421S. doi:10.1007/s004070050007. JSTOR 41134091. Edmunds, M. G. (2014). "The Antikythera Mechanism and the Mechanical Universe". Contemporary Physics. 55 (4): 263–285. Bibcode:2014ConPh..55..263E. doi:10.1080/00107514.2014.927280.